Tom Shaw Trio supplies live music that's light, elegant, rhythmic, sophisticated, fun and always melodic. Tasteful renditions of the greatest songs by Gershwin, Porter, Rodgers, Kern, Ellington, Berlin and more, including Classics, jazz, Broadway, blues, standards, Latin and swing... with or without vocals. Perfect for listening or dancing. 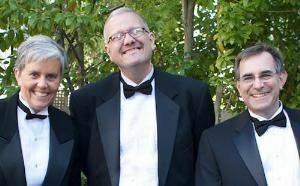 Tom Shaw - longtime party, wedding, event, cabaret and musical theatre pianist who has been performing in San Francisco and around the Bay Area since 1978 - is proud to present for your consideration, Tom Shaw Trio. Professional, versatile, talented, warm and personable, Tom Shaw Trio is three first-class musicians - John Greitzer on bass, Roberta Drake on percussion, with Tom Shaw on piano and supplying the vocals - who will provide your venue or event with high-quality background sounds or foreground entertainment. And Tom Shaw Trio will gladly learn any number of special song or music requests you may have in advance of your event, if they're not already a part of our repertoire. If we have no upcoming public appearances scheduled, you would be more than welcome to meet up with us during one of our weekend or weekday rehearsals. Tom Shaw Trio is also available to travel outside of the San Francisco Bay Area (i.e. Santa Rosa, Sacramento, Carmel) and beyond. Please visit our website for videos (or search for us on YouTube) and more information. Thank You!